Liquid meters, flow gauges, or flow indicators are all terms that are used interchangeably to refer to what is most commonly called a flow meter. A flow meter is a type of instrument that measures the amount of fluid, liquid, or gas (the flow) that travels through a piece of equipment. There are a few different types of flow meters that, depending on the industry and the application, will differ in the method of measurement. The most frequently used type of flow meter is the positive displacement flow meter which is also the most unique type because it accumulates a fixed volume of fluid first and then counts how many times this set volume is filled to give the total measurement of flow. This is the only type of flow meter that gives an exact measurement of volume, other flow meters use some other measurement as a variable which is then used to give a final flow rate. The Green Garde Flow Master Electronic Digital Flow Meter is an example of a reliable positive displacement flow meter that works well with a variety of pressures and applications. This electronic flow meter is ideal for use with the JD9-C high pressure spray gun which gives you total control over every application. The Green Garde Flow Master can handle volumes up to 10,000 gallons and has no moving parts which ensure trouble free operation. Mass flow meters are another type of flow meter that use the mass of the liquid or gas to determine the flow rate. Thermal and Coriolis flow meters use this type of measurement as does the ARAG® Electromagnetic Visual-Flow Flowmeter 0.13-2.6 GPM which can be used across a wide variety of applications and has superb accuracy with 0.5% error. 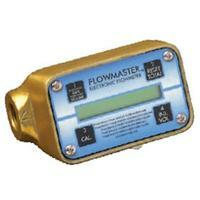 The ARAG Flowmeter also has a very high resistance to turbulence and integrates easily with existing rate controllers. The measurement of the flow rate by the velocity of a liquid or gas is used by velocity flow meters. Turbines, electromagnetic, sonar, and propellers use velocity flow meters. No matter what your application or industry, the type of flow meter you choose will have a big impact on your flow control and productivity. Whatever your specific needs require, Sprayer Depot has a wide range of flow meters and accessories to help you monitor your applications with ease and accuracy!